Once upon a time, millions of years ago, the waves of the ancient Sarmatian Sea were beating the shore here. Wild and waste was the land and only the winds crossed the neverending sea space. Thousands of years passed. Gradually the sea drew its waters back and thick forests covered the old sea bed. Wild brooks drifted clear flows of water and their chant filled the vicinity with ringing sounds. Birds' songs echoed in the forest. In this no man's land the rocks loomed high like lonely strangers bound for the unknown. The sun and the wind carved their wooden fairy-tales on them. Nobody knows when the first words uttered by a human broke the peace of this place, but many many years ago the ancient Getae lived here. They built a sanctuary of Zalmoxis, the Great God, in the dark abyss of the bottomless cave wrapped in the mysterious dusk of the thick ancient forest. Aladzha Monastery is the most famous among the numerous rock monasteries that existed alongn the Bulgarian Black Sea coast in the 13 - 14 centuries. These unique cult monuments are spread out over a vast territory, including the Balkans and the Near East. The cave monasteries were part of the life and religious practice of the hermits and the early monastic confraternities from the 4th to the 6th centuries whose traditions were later continued by the medieval rock monasteries. The real Christian name of the monastery is unknown to us. The word "aladzha" is of Persian-Turkish origin and means "motley, colourful". The monastery might have been given its name due to the murals preserved in the chapel. A legend has it that the original name of the monastery was St. Spas, originating from Christ the Savior. 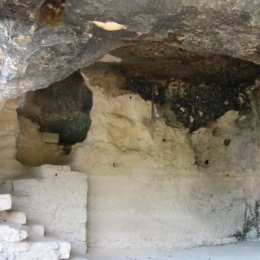 Some scientists believe that the Varna rock monastery made part of a large complex consisting of over 500 similar cloisters on the territory of Northeastern Bulgaria that were connected with Hesychasm, the doctrine of the holy energy, which was disseminated in Byzantine and Bulgaria in the 13-14 cc. Aladzha Monastery is one of the few rock monasteries on the territory of Bulgaria with clearly distinguishable premises, situated on two levels in a 40m-high limestone rock - monastery temple, chapel, requiem church, crypt (cemetery), kitchen, dining room, monastic cells and farm premises. ...Today no living person knows where the entrance to the secret treasury is and many treasure hunters are still looking for it. The ancient forest and the rocks carefully keep their secrets. In moonless nights, some dare-devils have ventured to go close to the ruins, they have told of weird flickering lights and dull bell chimes coming up from under the earth.